A couple who say their home has been blighted by noise from a wind farm have won a 20% reduction in council tax because the house's value has dropped. Julian and Jane Davis moved into a house on Mr Davis' farm in 2001 and planned to extend the property. In 2006, eight 100m (328ft) wind turbines were put up 930m (3,051ft) from the house in Spalding. A council tax tribunal panel ruled the wind farm had reduced the value of the house and changed it from Band B to A. "This has completely blighted our lives," said Mrs Davis. "Most of the time the noise is serious and all the time it is annoying. "By September 2006 [three months after the turbines were installed], we were forced to sleep on people's floors just so we could get a night's sleep. By December we decided to rent another house so we would have somewhere to sleep." 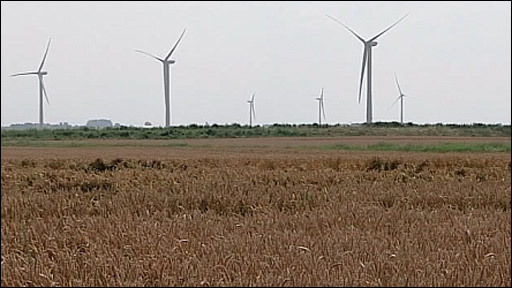 Wind Prospect Group Limited, which constructed the turbines, said investigators did not find the noise was a nuisance. The couple claim they can hear different types of noise at various times of the day and night, including "swishing, ripping/flashing, low frequency humming and mechanical turning, background roar and helicopter noise (aerodynamic modulation)". Their council tax was reduced by £200 a year, Mrs Davis said. Although investigators sent by the Lincolnshire Valuation Tribunal to measure noise levels did not find any problems, the panel conceded the construction of the windfarm "had had a significant detrimental effect on the appellants' quiet enjoyment of their properties. "The tribunal therefore found that the nuisance caused by the wind farm was real and not imagined and it would have had some effect upon the potential sale price of the appeal dwellings." In a statement, the developer Wind Prospect Group said: "After a review of recordings obtained and their own observations on site, the opinion of the environmental health professionals was that at no time did the noise experienced or recorded amount to a statutory noise nuisance." The turbines are now owned and operated by Fenland Windfarms Ltd, a subsidiary of EDF Energies Nouvelles.